- Flat runways for general service use. - Electrical release, just press UP and DOWN button to control the lift. - The 630mm wide platforms for easier driving on and off. 3000mm distance between two columns compatible to 3D wheel aligner. - Driving-on ramps with polymer rollers. - Reserved tracks on platforms fit for optional rolling jacks. - Low profile runways with a minimum height of 150mm allows the vehicles drive on and off conveniently. - 24V safe control system. - Solid and robust cable pulleys. - Self-lubricated bushing and bearing. - Platforms non-synchronization alarming system. - Safety device works immediately in case a cable slacks or fails. 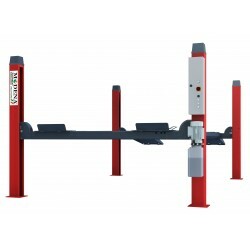 - The buzzer alarms when platforms lowered to 300mm above ground. - Aluminum motor with fan on top to avoid overheating caused by long time working. - It has been proofed by dynamic test with 115% of rated capacity and static test with 150% capacity.